If you no longer have an active portal subscription, please open a support ticket to recieve a link that re-enables access to the image free of charge. The pfSense factory version is the version that is preinstalled on units purchased from Netgate. The factory image is optimally tuned for our hardware and contains some features that cannot be found elsewhere, such as the AWS VPN Wizard. Write the image to a USB memstick. Locating the image and writing it to a USB memstick is covered in detail under Writing Flash Drives. 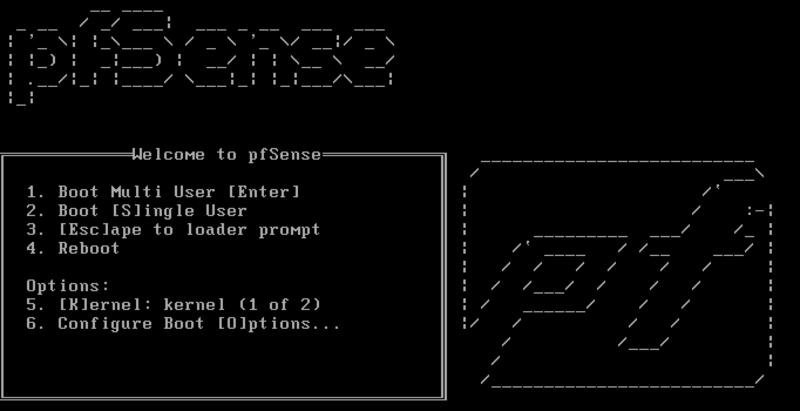 Connect to the console port of the pfSense device. Connecting to the console port. Cable is required. Insert the memstick into an open USB port and boot the system. After a minute the pfSense loader menu will be displayed that contains options to Boot Multi User, Boot Single User, Escape to loader prompt, Reboot, select a non-default kernel or configure boot options. Either allow the menu to timeout and boot on its own, or press 1 to boot normally. The factory images of pfSense already have appropriate console port options. Console options are presented for serial console installation. The default option is vt100, which should work for most. Choose the correct console output for your system. Please choose the appropriate terminal type for your system. The installer will automatically launch and several options will be presented. On Netgate firewalls, choosing Enter for the default options will complete the installation process. Options such as the type of disk partition can be modified through this installation if required. The final step of the installation will be a prompt to Reboot the system. Select Reboot and press Enter. The system will shut down and reboot. Remove the USB drive from the USB port. pfSense will restart automatically. If the USB drive remains attached, the system will boot into the installer again because by default the system firmware is configured so that a device plugged into the USB port will be booted with a higher priority.